Director Jodie Foster's topical thriller Money Monster certainly has its heart in the right place. Its brain, though, is another matter. What promises to be a ripped-from-the-headlines drama with comic undertones, a throwback to such 70s gems as Dog Day Afternoon and Network, instead turns out to be too farfetched to gain any traction — it's ripped from the headlines, all right, but only the type one might see gracing the front of the National Enquirer. In the minds of its makers, it's the celluloid equivalent of "Men Walk On Moon" and "Nixon Resigns"; in actuality, it's more like "Hillary Clinton Adopts Alien Baby" and "Bigfoot Kept Lumberjack As Love Slave." Then again, when one of the scripters is the guy who penned those dopey National Treasure films, this is perhaps the inevitable result. The setting is a TV studio wherein the smug Lee Gates (George Clooney), the host of an inexplicably popular money-management program, is prepping for the next episode while Patty Fenn (Julia Roberts), his director, patiently tries to keep him in line. 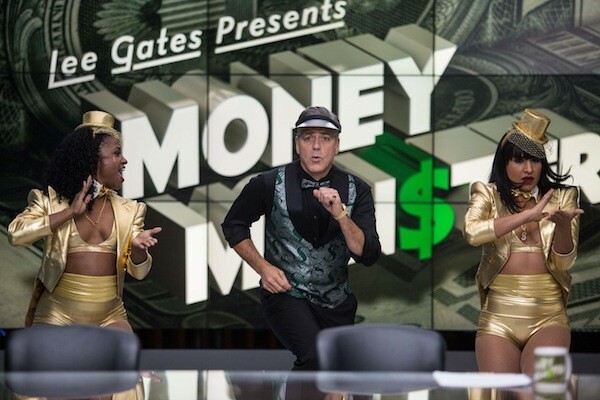 Ibis, a company that Gates has been praising to the rafters, has just lost 800 million dollars of its investors' money, and the episode about to air will focus on getting answers behind the meltdown the company blames on a computer glitch. But just as the live taping gets underway, a struggling working-class guy named Kyle Budwell (Jack O'Connell) storms the set. Brandishing a gun, he places a bomb-adorned vest on Gates and threatens to blow everyone up unless he's given a satisfactory answer on how Ibis managed to lose so much dough. He has a personal reason: Receiving a $60,000 inheritance, he invested all of it in Ibis stock, simply because Gates told his national audience it was a sound business venture. Clearly, Kyle's a moron — given his buffoonish on-air antics and obvious disdain for others, I wouldn't trust Gates to give me directions to the shoes on my feet — but since Kyle represents us, the poor rabble being snookered daily by those with power and wealth, we're expected to line up behind him. Meanwhile, while Kyle continues to wave his weapon at Gates and British actor O'Connell continues to speak in an overly studied New York accent, Patty is feverishly trying to locate Ibis' CEO (Dominic West), who's been conspicuously MIA, and unravel the mystery surrounding the wayward money. Some mystery; whereas in real life it would take weeks, months, maybe years, to uncover and understand everything, here it takes about the same amount of time required to unwrap a stick of gum. "Not every conspiracy is a theory," notes the movie's tagline, a reminder that Roberts went down this route before when she starred opposite Mel Gibson in 1997's Conspiracy Theory. In this new picture, though, her role is more comparable to that essayed by another actress in another film. Patty Fenn is to Clooney's Lee Gates what Kate Winslet's Joanna Hoffman was to Michael Fassbender's computer magnate in Steve Jobs: his competent right-hand woman and his more sensible sounding board. Roberts provides a calming presence and fares better than Clooney, who's saddled with a character who makes some unbelievable personality shifts over the course of the film. Money Monster is certainly watchable, and there are some nice individual scenes: I especially liked Gates' reaction to Kyle's claim that "$60,00 is probably pocket change to you," and the sequence involving Kyle's pregnant girlfriend (Emily Meade) does not go where one might expect. But this is the sort of picture that suffers in the aftermath, when its ludicrousness becomes ever more pronounced in the mind. Catch this during a matinee, and you'll be adding another meaning to dog day afternoon.